Americans in the World War II era bought the novels of African American writers in unprecedented numbers. But the names on the books lining shelves and filling barracks trunks were not the now-familiar Richard Wright and Ralph Ellison, but Frank Yerby, Chester Himes, William Gardner Smith, and J. Saunders Redding. 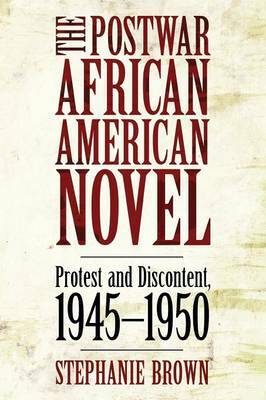 In this book, Stephanie Brown recovers the work of these innovative novelists, overturning conventional wisdom about the writers of the period and the trajectory of African American literary history. She also questions the assumptions about the relations between race and genre that have obscured the importance of these once-influential creators. Wright's Native Son (1940) is typically considered to have inaugurated an era of social realism in African American literature. And Ellison's Invisible Man (1952) has been cast as both a high mark of American modernism and the only worthy stopover on the way to the Black Arts Movement of the 1960s. But readers in the late 1940s purchased enough copies of Yerby's historical romances to make him the best-selling African American author of all time. Critics, meanwhile, were taking note of the generic experiments of Redding, Himes, and Smith, while the authors themselves questioned the obligation of black authors to write protest, instead penning campus novels, war novels, and, in Yerby's case, ""costume dramas."" Their status as ""lesser lights"" is the product of retrospective bias, Brown demonstrates, and their novels established the period immediately following World War II as a pivotal moment in the history of the African American novel.